The majority of students in Kindergarten to grade 12 cleared out their desk or locker this week, tossed their backpack in the garbage and started complaining of boredom. Ah, the lazy days of summer are here, or at least for the kids. U.S. dairy processors are not on vacation, as they have a great deal on their plate, or in their glass, as they make sure their products will still be served in school meal programs as well as a la carte starting July 1, when new regulations on various nutrients and ingredients go into effect. Need additional information on the regulations, USDA offers many resources that can be accessed HERE. For specific regulations regarding beverages, including milk, you can access a comprehensive article I recently wrote for Food Business News HERE. There’s definitely lots of activity on the school menu front, but also in the retail sector. In fact, Daily Dose of Dairy subscribers attending the IFT Annual Meeting + Food Expo in New Orleans June 21 to 24 can expect to see many exhibitors showcasing milk and milk beverage prototypes using innovative flavors as well as calorie-free sweeteners. For more information on IFT 2014, link HERE. It’s imperative that milk processors get creative with their offerings in order for milk to be the chosen beverage. After all, the number of beverage options available to consumers is not decreasing. Why would one choose the boring white stuff when they can customize a self-dispensed beverage on the Coca-Cola Freestyle? This sleek, stylish proprietary fountain machine can dispense nearly 150 regular to no-calorie branded beverages, from waters to sports drinks to sodas, at the touch of a screen. To read more about how flavors make milk yummy, link HERE. In Barcelona, the manufacturer of Cacaolat, a high-quality cocoa milkshake whose secret formula has remained unchanged since 1933, recognized that many of its older, faithful consumers had cut back or stopped drinking Cacaolat all together for health reasons. To keep them customers, the company developed Cacaolat 0%, a chocolate milkshake without fat or added sugars. The lower-calorie beverage is sweetened by stevia and also now contains fiber. According to the company, Cacaolat 0% has the same amount and quality of cacao as Cacaolat original, and so it delivers on taste and texture. It also is gluten free, which appeals to a growing segment of the population. In the U.S., Cow Wow Cereal Milk has made getting a full serving of dairy into diets simple, even for the pickiest drinkers. Now, instead of an ice-cold glass of plain old milk, children and adults alike can indulge in the unique flavors of milk that tastes like a bowl of cereal. While the beverage tastes like it could be a sinful dessert, it is actually a mom-approved healthy treat. The innovative dairy drink replicates the tastes of favorite cereals and infuses them into organic 1% milk. Cow Wow Cereal Milk is low fat, all natural, non-GMO, gluten free and kosher. And, it contains nine essential vitamins with only 6 grams of added cane sugar. This fun-flavored milk makes opting for a healthier alternative to soda and juices a no brainer. Cow Wow originally debuted in two flavors--Fruity Trudy, and Chocolate Chip Cathy—with Cinny Minny recently joining the lineup. These concoctions are reminiscent of favorite childhood cereal flavors that resonate with kids as well as the kid in all of us. Cow Wow makes children feel like they’re getting away with something and mom happy to know that they’re not. 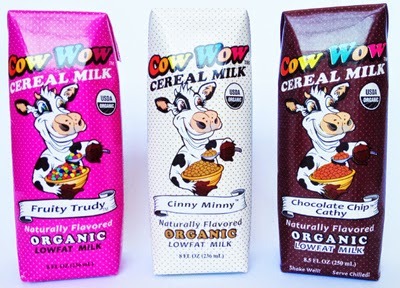 Cow Wow Cereal Milk comes packaged in 8.5-ounce single-serve aseptic cartons. For more information, link HERE. In Canada, Agropur Dairy Cooperative’s Natrel brand has “tapped” into one of Eastern Canada’s favorite flavors: maple. New Natrel Maple Milk joins the company’s other premium flavored milks that contain nothing artificial. The natural maple flavor is made from real Canadian maple syrup. The milk can be enjoyed as is, but is also positioned as a way to add a layer of flavor in baking, cooking and specialty drinks. 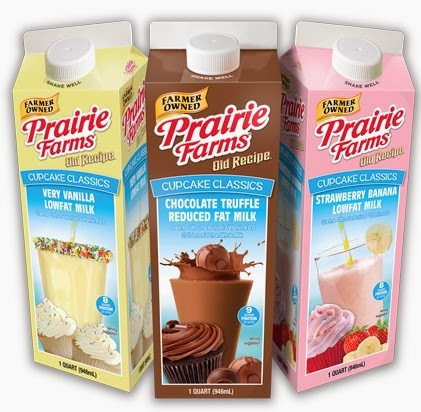 Back in the States, by far, the most progressive flavored-milk innovator is Prairie Farms Dairy. Most recently the company introduced three flavored milks with a summer theme. Sold under the company’s Old Recipe sub-brand, these limited-edition flavors are the inaugural offerings in the Cupcake Classic series. To read more about the company’s three limited-edition spring flavors, click HERE. The cupcake theme was chosen because of the current popularity of birthday cake ice cream. The difference being that the cupcake theme does not risk limiting usage occasion as birthday cake might. The one super indulgent flavor is Chocolate Truffle Reduced-Fat Milk. The other two--Strawberry Banana Lowfat Milk and Very Vanilla Lowfat Milk--are lower-sugar offerings. According to Warren Taylor at Snowville Creamery in Ohio (so happy to reconnect after many years), milk from grass-fed cows is a way to differentiate and add value to the otherwise boring white stuff. Milk from grass-grazed cows is higher in omega-3 fatty acids and conjugated linoleic acid (CLA). These fatty acids are essential, vital nutrients for heart and brain function. 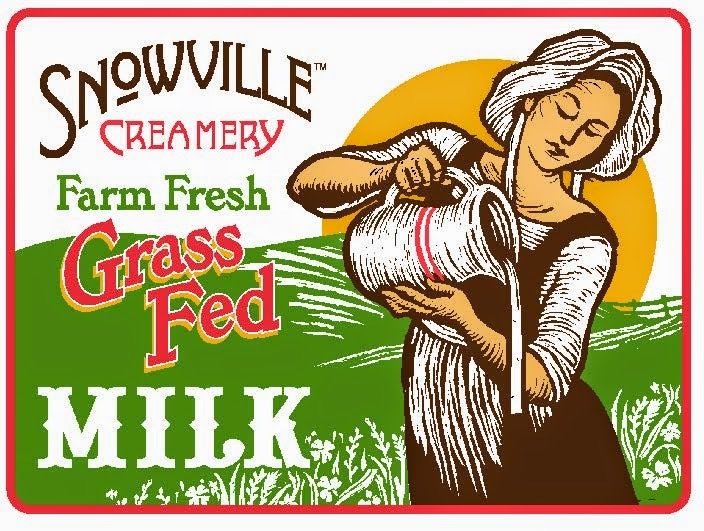 Grass fed milk is also higher in beta-carotene and vitamins A and vitamin E.
Snowville Creamery offers an array of fresh milk and cultured products based on grass-fed cows milk. Interestingly, the company does not homogenize the milk in order to provide a product that is minimally processed. Without homogenization, the cream naturally rises to the top of the container. Consumers are instructed to simply shake and enjoy. Here’s a product you won’t see at IFT but will be showing up at natural and specialty food stores in Southern California very soon. The product is Desert Farms Camel Milk and it is being embraced by health-conscious consumers, parents of autistic children and people with diabetes. 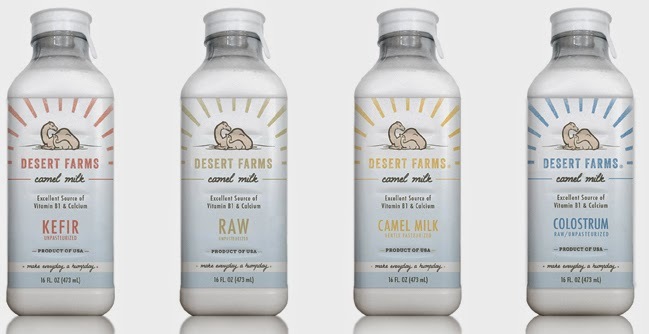 Containing only milk from U.S.-based camels and bottled entirely in America, Desert Farms Camel Milk is available in several distinct varieties: Raw Camel Milk, Raw Camel Milk (Frozen), Raw Camel Milk Kefir, Pasteurized Camel Milk, Raw Camel Milk Colostrum (1st) and Raw Camel Milk Colostrum (Regular). This is perhaps the most unusual and some believe long overdue addition to the fast-growing trend toward Middle Eastern cuisine in this country. More expensive than cows milk, after all, there aren’t that many camels in the U.S., plus pregnancies last about 14 months, camel milk is considered richer, more filling and more easily digested than milk from other species or vegetarian milk substitutes. Want to learn more about this new dairy case beverage, link HERE. Hope to see many of you at IFT.